Wireless networking isn't just for computers. Another increasingly popular use for wireless networks is gaming with video game consoles, such as the Xbox or PlayStation. 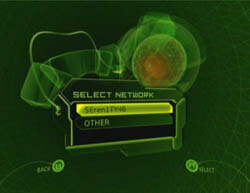 Modern game consoles can network with each other for linked-system play, and with a service like Xbox Live they can even connect to the Internet where you can play against people from all over the world. To add a game console to your wireless network, you need to know the SSID, encryption settings, and security keys for your network. 1. Select a wireless adapter specifically designed for your game console. 2. Collect the SSID, encryption format, and encryption keys for your network and keep them handy. 3. Turn on the power on your game console and remove any game discs. 4. Connect the power cable to the wireless adapter; then connect an Ethernet cable between the adapter and the game console's Ethernet port. 5. Insert the wireless adapter's setup disc in the game console and close the tray. 6. If your wireless network is detected (see Figure 1), choose it and press A. Otherwise, choose Other and press A. Figure 1: Choose your network if it appears in the list. 7. Enter your network's SSID as the network name. The SSID is case sensitive, so make sure you enter it correctly here. 8. On the Wireless Settings screen, shown in Figure 2, choose Security Type and press A. 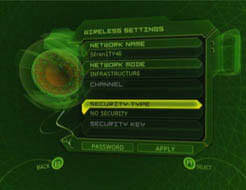 Figure 2: Adjust network security settings. 9. Choose the security type used by your network and then press A. Most game console adapters are not compatible with WPA encryption. 10. Enter the encryption key and then choose Done. 11. On the Wireless Settings screen, choose Save and press A. 12. Check the status of your connection on the Wireless Status screen. The Wireless Status screen shows your connection speed and signal strength. If the signal strength is poor, try repositioning the wireless adapter so that it is high and not blocked by large furniture or other obstructions. If you are unable to create a successful connection, double-check that the SSID, encryption format, and encryption keys are entered correctly. In your router, temporarily disable WPA or WPA-PSK encryption if it is enabled. 1. Turn on your game console, but make sure the disc is empty. 2. Choose Settings, as shown in Figure 3, and press A. Figure 3: Choose Settings on the console's main menu. 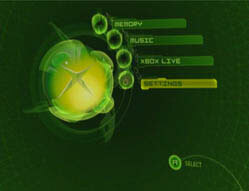 If you have Xbox Live installed, choose Main Menu on the Xbox Live menu to reveal the menu shown in Figure 3. 3. In the Settings menu, choose Network Settings and press A. 4. In Network Settings, choose Advanced and press A. 5. Choose Wireless and press A to reveal the Wireless Status screen. 6. Choose Settings to open the Wireless Settings screen. There you can change the SSID, security type, and encryption key used by your network. 7. When you are done, choose Save on the Wireless Settings screen and press A to save your changes. If you ever change your network's SSID or encryption key, you will need to adjust wireless settings in your game console as well. 1. Purchase and install an Xbox Live subscription kit. Xbox Live subscription kits are available at most electronics and video game retailers. You need a valid credit card when you create an Xbox Live account, even though you won't need to make an online purchase if your subscription kit contains a valid subscription. 2. If your Xbox doesn't log in to Xbox Live automatically when you turn it on, remove any disc from the tray and choose Xbox Live from the main menu. 3. Choose your Xbox Live account, or choose New Account if you want to create a new account. 4. In the Xbox Live menu, choose Account Management to update your subscription or change other account settings. If a game is compatible with XBox Live, it should log in and allow online play automatically. If XBox Live doesn't work, check the status of your XBox's network connection, and also double-check that your XBox Live subscription is up to date. Subscriptions must usually be renewed annually.